It’s October, and so we’re shifting into more fall and Halloween related books. We have not one, but two different Berenstain Bear Halloween adventures, and a couple of Curious George’s as well. I’m not going to lie – those are not my favorite reads, but the girls love them and so we read. (I’ve been known to put a one BB cap a night rule in place.) I tend to prefer a good, dark read that isn’t necessarily Halloween related, but seems perfect for this time of year. 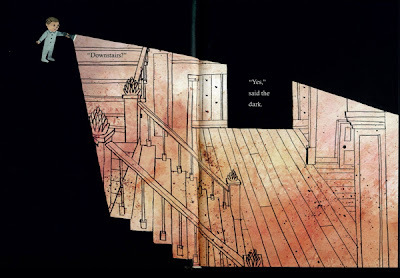 “The Dark“, by Lemony Snicket and our own house favorite, illustrator Jon Klassen, is perfect. 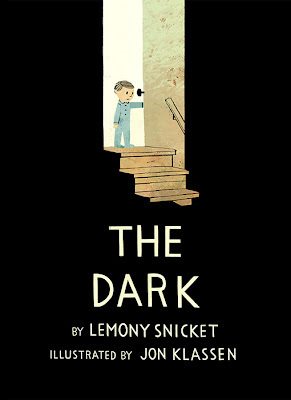 It’s quiet, thoughtful, suspenseful… and the little one curls up just a little tighter as we read. 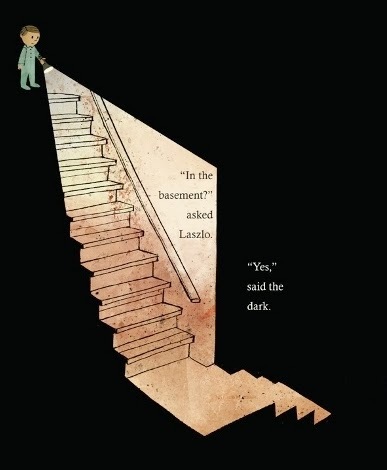 In the beginning of the story, Lazlo is afraid of the dark. In Jon Klassen’s masterful illustrations, it feels like fall. 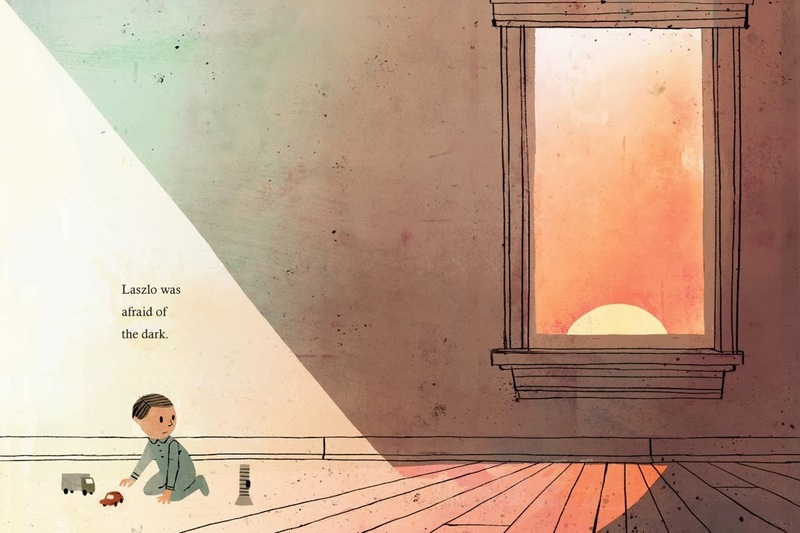 The sun is setting earlier, and Lazlo is noticing that the dark is creeping into the routine of his day more and more. You can see it in Lazlo’s posture, his awareness of the sun’s position, and what its setting means. The angle of the setting sun sharpens, and then Lazlo’s flashlight cuts triangles through the dark, illuminating the space in front of him. But Lazlo’s body is always surrounded by darkness, and the girls both say when they look at the photos that they can sense how nervous Lazlo is about all the things that he cannot see around him. The study in shadows and light in this book alone are worth the price of admission. I’ve always loved books that get the details right – particularly when it comes to the age and style of the house where the characters live. I especially love this one because it could be one of a dozen of our friends’ houses – with the Victorian era trim, the entry hall staircase, the door to the basement. Lazlo’s flashlight follows his path from his bedroom to the place where the dark lives, and once he knows the dark, he’s no longer afraid. I would recommend “The Dark” even for young readers – it’s suspenseful, but not too scary. 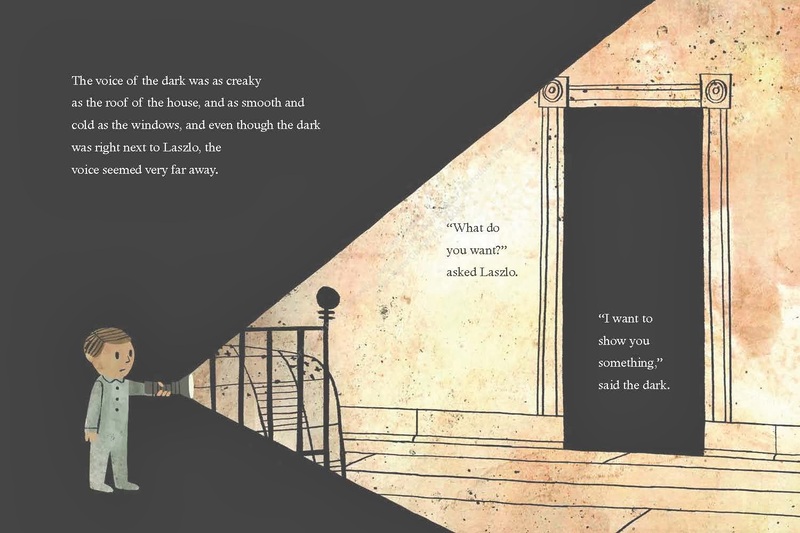 Perfect for four- to eight-year-olds, but I think even older children would delight in the illustrations and Lazlo’s slightly nervous conversations with the dark. A perfect Halloween gift, for sure.